Claire Potter reflects on this event held by The Great Recovery and Ella Doran, on 25th September as part of London Design Festival. Reposted, with thanks, from The Ecospot Blog. Quite often, it is the things that go unnoticed that have the biggest impact. Take fire labels for instance. They are a small part of a chair, or sofa, yet without these little pieces of legislative fabric, the whole piece of furniture cannot be reused. And even though they do seem small, they are often cut off as they flap about under cushions – and many of us do not realise that this then consigns our furniture to landfill at the end of its life. Understanding these challenges, both small and large, is the baton that The Great Recovery has taken up in their ‘Rearranging the Furniture’ Design Residency in collaboration with SUEZ. 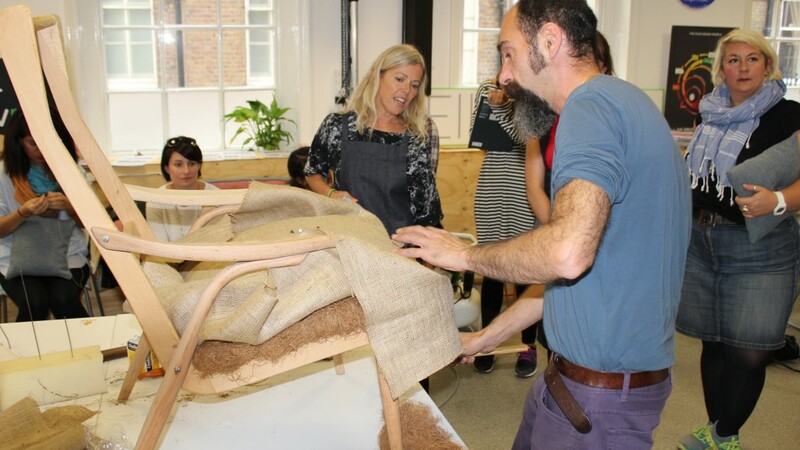 And to celebrate the end of the project, The Great Recovery held a day as part of the London Design Festival, with a roundtable discussion from the experts, designers and practitioners who took part and some practical demonstrations of upholstery. Patrizia Sottile and Andrea Simonutti – of Urban Upholstery are no strangers to reuse, as their pieces use rescued frames which are brought back to life with traditional methods, and the first part of the session was dedicated to a demonstration of how to refurbish a sprung chair, which itself had been recovered for a new life. Springs were connected with string, meshed together in a pattern that will be both strong and flexible, then covered with hessian, stitched, then covered again with coconut fibres. This is a craft – hand created and little altered in centuries. And, as the Urban Upholsterers explained, allows a piece to be reused, recovered, refurbished and repaired – unlike the cheap and mass produced pieces that we can pick up from chain furniture stores. Cheap construction means that long life, recovery and reuse is often impossible. Created by British fabric manufacturer, Camira, in collaboration with The Great Recovery, the ‘Survivor’ fabric was developed to use as much pre-consumer fabric waste as possible. The new weave is created with 30% recycled wool fibre – recovered, shredded and woven into a new, tweed like fabric. 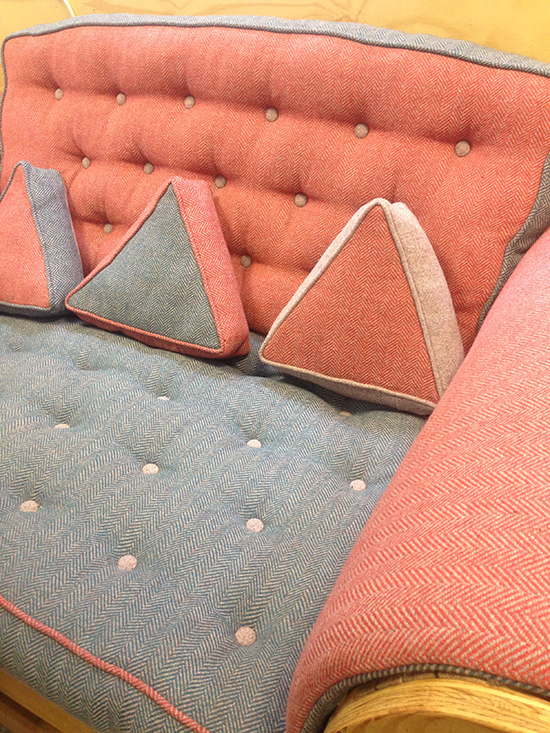 The fibres are from offcuts of Camira fabrics, collected from contractors who use their upholstery range. And whilst 30% recycled yarn does not sound like a lot, it is actually quite groundbreaking. Each time a fabric is recycled, the yarn shortens, making it increasingly difficult to use in a new fabric – it literally is not strong enough. However, if it is mixed with some virgin wool yarns, a natural recycled fabric is possible. The Survivor fabric is just that – and will hopefully soon be available to specifiers. 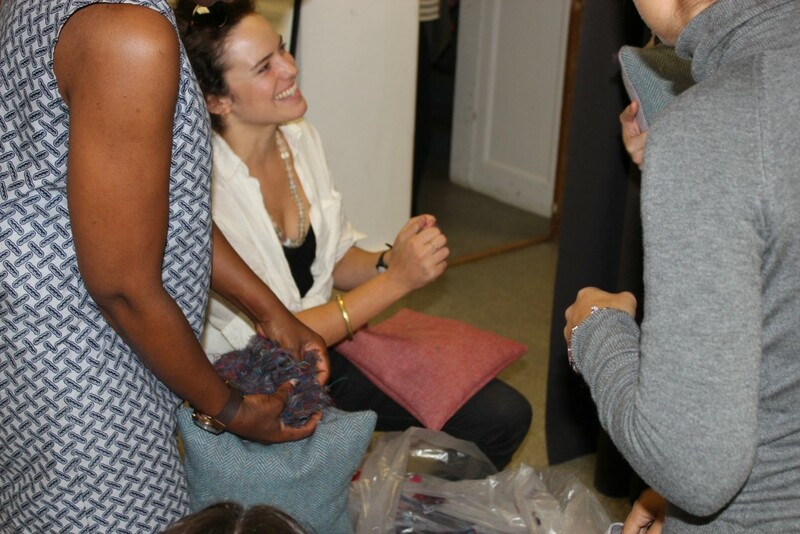 On the day, we were able to use the beautiful fabric to create our own cushions, in any variety of the three colourways – blue, red, or violet. Plumping (excuse the pun) for blue and red, each of our cushions was stuffed with recycled (post-consumer) yarn and finished with more traditional skills – we each learnt the ‘invisible stitch’, allowing us to close our cushions with no stitching visible. 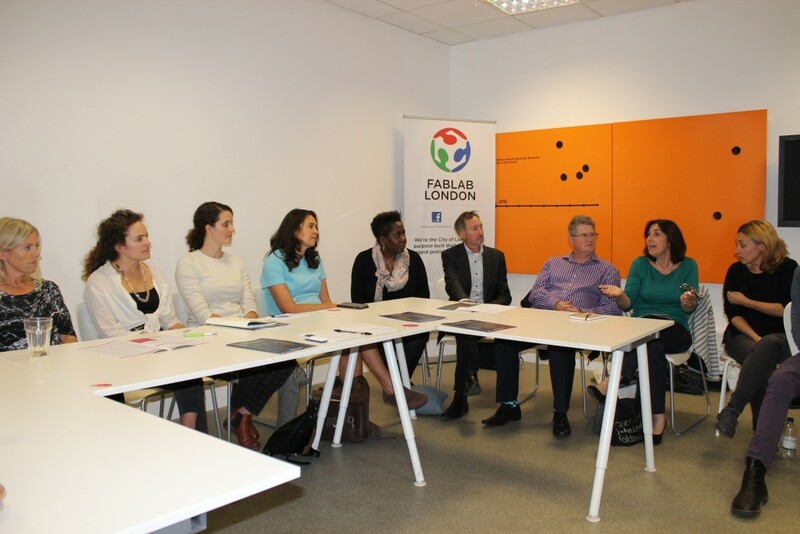 The day concluded with a round table discussion between many of the experts involved in the bulky waste design residency. Representatives came from across The Great Recovery’s network, including Surrey County Council, Suez, Global Action Plan, Camira, London Re-use Network and Surrey Re-use Network, as well as the designers involved in the residency. Discussion centered on the need to make the services and systems that facilitate furniture reuse as efficient and user friendly as possible. Because, along with considered design of products, achieving this is key to helping connect individuals and organisations with furniture no longer required with those individuals and organisations seeking it. Behaviour change – from something as simple as not removing a fire label, through to rethinking the timeframes involved in passing on furniture – was seen by many of the panel members as a key part of their own work. Language and the way we talk about ‘waste’ and ‘reuse’ was identified as having much potential to shift our perceptions and the value we place on items that are not brand new. Data about reuse were raised as a current hurdle but potential opportunity for increasing reuse. May Al-Karooni from Globechain explained the challenges she and others had faced in finding data about reuse and its impact – data valued highly by investors – because unlike recycling, there are not the data available. 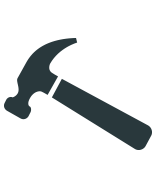 Globechain are tackling this through the reporting they offer users of their reuse platform – enabling organisations to identify financial savings and social impact from offering furniture and fittings for reuse. And my cushion? It got its first test on the train back to Brighton from London Bridge, as surprisingly, there were no free seats. Lucky I’d just made one.